Wind tunnels, such as this one at General Motors' tech center in Warren, Mich., provide real-world aerodynamics data to automakers. Ford's big, bruising Atlas Concept pickup displayed at the 2013 Detroit auto show showcased advanced aerodynamic features. Its active wheel shutters closed at highway speeds to seal gaps between spokes, reducing wind turbulence around the wheels and tires. And its front air dam raised and lowered at different speeds to improve underbody airflow. Neither feature made the 2015 F-150. But with the Atlas, Ford was showing how future vehicles will cut through the air more efficiently, said Stephen Remondi, CEO of Exa Corp., a Boston-area software company whose PowerFLOW simulation program is widely used by automakers to reduce aerodynamic drag. Although fuel prices are down and petroleum industry experts expect gasoline prices to stay relatively low for another six months to a year, automakers still must meet stiffer global fuel economy and emissions standards. So there has been no letup in efforts to improve fuel efficiency. After powertrain improvements and weight reductions, slippery aerodynamics is the hottest area of research to boost efficiency. Here's why: At highway speeds, vehicles get a 5 percent fuel economy gain for every 10 percent drag reduction, Remondi said. And wind tunnels still have a role, even though automakers now do most design work with software. But the companies still want real-world data from a wind tunnel. General Motors is building a second wind tunnel at its tech center in Warren, Mich.
Jaguar Land Rover, BMW, Ford, Renault-Nissan, Toyota, Volkswagen and Hyundai-Kia are just a few of the automakers using Exa's PowerFLOW program. The company says 14 of the 15 top automakers are using it. A vehicle's ability to slip through air is measured by drag coefficient, a complex formula that includes a vehicle's shape, surface friction and other factors. Advanced vehicles now have a drag coefficient below 0.25. For a small automaker such as Jaguar Land Rover, which has said it will launch 50 models or updates in the next five years, speed to market is important. So the company is relying on computer simulation for a growing amount of its initial design and engineering work. "We are in the process of transferring a major part of our engineering from the physical world into the virtual world," said Mark Stanton, Jaguar Land Rover's vehicle engineering director. "Other industries, like aerospace, have already gone down that path, and we are building on their experience." Computer simulation enables designers to measure airflow over, under and around vehicles before those vehicles are built, then tweak bumpers, doors, trunk lids, wheels and other parts to ensure a slippery shape that also is appealing to the eye. "In a wind tunnel, you get to measure the drag, but you don't get to see why [the air behaves the way it does]. If I understand why I got better or worse, I can maybe make it even better than that rather than just trial and error," Remondi said. So wind tunnels remain important because they verify the accuracy of computer designs. They also can help engineers identify areas that could be the source of wind noise or air and water leaks. At GM, even though designers are using computers to improve aerodynamics, more time is being spent in the wind tunnel, said Holt Ware, Buick's director of exterior design. "The computer helps you get the best estimate you can have before you get in the tunnel. And it helps you work more efficiently in the tunnel," he said. But computer software has limitations. 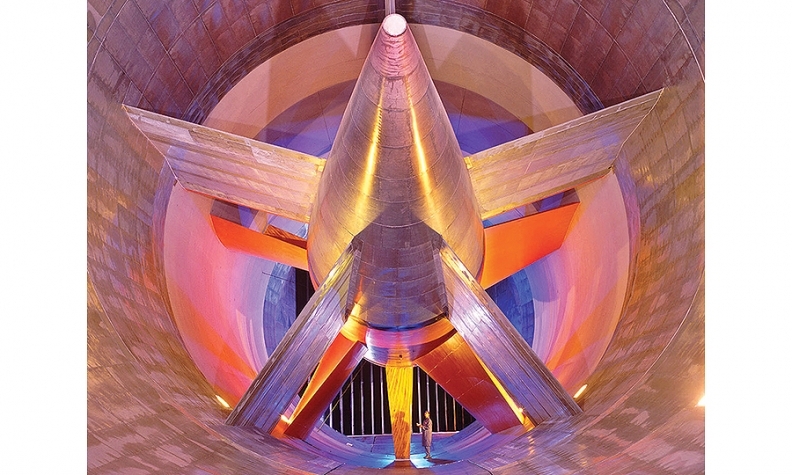 For instance, few wind tunnels are identical, and that affects the way a computer program measures aerodynamic drag compared with actual wind tunnel testing. "We are always trying to make our cars more fuel efficient, so we've increased the effort we spend in the tunnel to get as accurate as we possibly can," Ware said. "We love to get as many things as we can on paper, and we have all these wonderful theories. But you really have to get in that tunnel to prove it out. The air is invisible. And we use many different ways to track that in the tunnel." 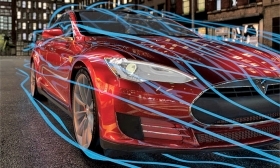 Aerodynamics of Tesla's Model S are tested using Exa Corp.'s PowerFLOW software. As for active body parts, some vehicles, such as the Ford Fiesta SFE, Ram 1500 HFE and the 2015 F-150, already have active grille shutters that close at highway speeds to improve fuel economy. And many sports cars have had rear spoilers that raise and lower automatically at different speeds. Said Buick's Ware: "It's like every car is a fish. And they all have their own flow signature in the ocean. Every car is different. Something on the bottom can change what is going on with the quarter panel, just the way the pressure and the air is distributed. But we are learning more and more about it, and I think we are getting sharper every day." As aerodynamicists work to find new ways to reduce wind resistance, movable or active body parts are being studied. Said Exa's Remondi: "I would definitely expect to see more active devices. 0.22 is the next target." Ford's Atlas Concept pickup showcased active wheel shutters that close, left, and open. At highway speeds, the shutters close to seal gaps, reducing wind turbulence.